The fun bento stuff I mentioned the last week finally arrived and I was very amused to see the description on the box on the customs form: “toys”. Toys is right! I felt like a kid on Christmas morning! 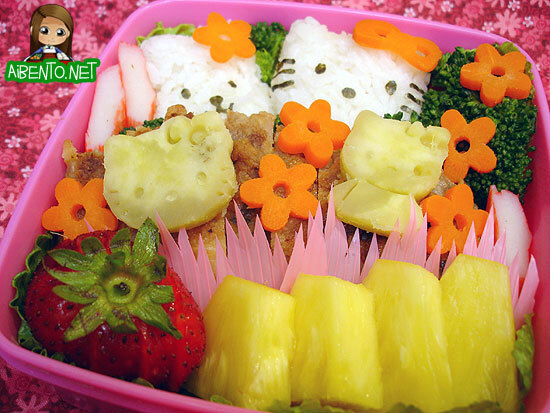 I decided I had to use them today to make a Hello Kitty themed bento! At the top I have a bunny and Hello Kitty onigiri. The nori was cut out with a punch. I was sad to see these punches were made of plastic as they were hard to punch and kept getting stuck. I had to keep tapping it with a butter knife to get the thing to snap back. But still, it’s great!! The set came with some adorable veggie cutters. 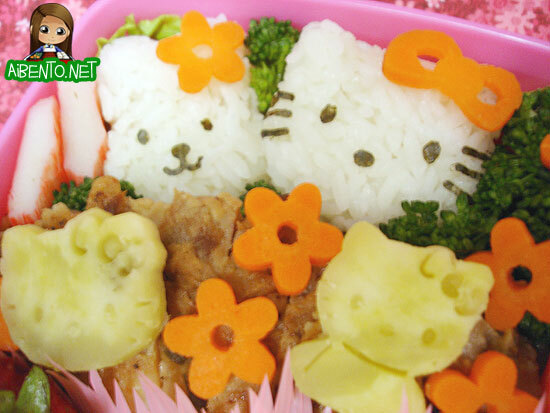 On top the mochiko chicken I have slices of baked sweet potato cut with my new Hello Kitty veggie cutters. Adorable!! I added pineapple and a strawberry and separated it with some pink sushi grass.